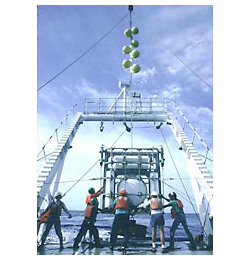 An HLF-5 acoustic source (250 Hz) being deployed from the Ocean Construction Platform (OCP) Seacon near Bermuda during July, 1990, for a tomography experiment. The acoustic source is the round, drum-like object mounted in the middle of an open aluminum frame. Photo courtesy of Scripps Institution of Oceanography. Acoustic tomography uses the travel time of sound in the ocean to measure the temperature of the ocean over large areas. Scientists use acoustic tomographic moorings to send and receive sounds. By measuring the travel time of sound between two moorings, scientists can calculate the temperature of the ocean over the area through which the sound traveled. An acoustic tomographic mooring consists of an acoustic transceiver package that includes a sound source and receiver. The mooring may also contain additional sensors to measure temperature, salinity, and the amount and direction that the mooring tilts. From top to bottom, an acoustic tomographic mooring consists of a subsurface buoy to keep the mooring stiff, a tiltmeter and compass package, a hydrophone array immediately above the acoustic source, an acoustic release package, and an anchor. The Applied Tomography Experiment moored the source in the above photo just above the seafloor near Bermuda. Researchers listened for its transmissions on U.S. Navy receivers, as well as a receiver towed by a ship. With the data they collected, scientists were able to measure the position of the Gulf Stream. This is because the Gulf Stream separates warm Sargasso Sea water to the south from colder water to the north, and sound in the ocean travels faster in warm water than in cold water. Typically, several moorings are set out in an array over the area to be studied. Data on acoustic travel times are measured and the changes in time are related to changes in sea temperatures. Using these data, large-scaled maps of ocean temperatures can be created. For more information about acoustic tomography see How is sound used to measure temperature in the ocean? and How is sound used to measure global climate change? Acoustic tomographic moorings can be left in place for up to one year. Once the experiment has been completed, scientists return to the study area. A specific signal is sent to the acoustic release that triggers it to release the mooring. The mooring floats up to the surface and is recovered. This recording is of the sound produced by a HLF-5 source at 250 Hz. The recording was made very close to the source, and the sound has been amplified so you can hear it better. Sound courtesy of Scripps Institution of Oceanography. Spindel, R. C., & Worcester, P. F. (1990). Ocean acoustic tomography. Scientific American, 263, 94–99. Munk, W., Worcester, P., & Wunsch, C. (1995). Ocean acoustic tomography. Cambridge, England: Cambridge University Press.